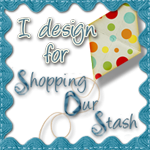 OK it's probably more exciting for me than it is for you...guess who's one of the new members of the SHOPPING OUR STASH design team?? Yep, you guessed it....ME!!! What's super exciting about this news is that my crafty friend JESSI is also on the design team and the other two new members of the team are BARB and CHRIS how exciting is that???!!! Here's a link to the latest Shopping Our Stash challenge and the design team announcement. Be sure to check out the Shopping Our Stash blog roll to visit the blogs of my new teammies!! Congratulations Donna.....guess it's my turn to boast on my blog. So excited to be there with you and Chris. awesome!!! I don't know, I'm pretty freaking excited about it too!! !